Why don’t we eat meat on Good Friday? On Good Friday, many Christians, not only Catholics, around the world will abstain from eating meat. Some know why, some have an idea, and others will just do it because that’s how they were raised. Also fish in the ancient world was more of an everyday food item and meats were reserved for celebrations. So now that we see what’s defined as meat we get to ask why we abstain at all. There are multiple reasons, all are valid, and all have theological significance. Christ died for us and gave His flesh for us on this day. Even the word Incarnation means to take on flesh. 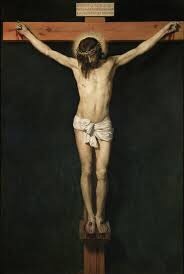 It was this flesh, taken on by the Second Person of the Blessed Trinity, that was given in an act of sacrificial love that redeemed the world. In memory of this event we abstain from eating flesh to remind us of this ultimate act of love on that mountain in Jerusalem. This one may sound like a stretch, because how is skipping the cheeseburger really suffering? Whenever we deny ourselves a legitimate good, we are engaging in mortification of the flesh, a kind of fast. In this we join our sufferings, no matter how minor or inconsequential they may seem, to the sufferings of Christ. What is lacking in the sufferings of Christ? Not one thing. His suffering and death is completely sufficient for our salvation, but just like Saint Paul we can join our sufferings with His for the salvation of souls. As I said earlier, meat was a food for celebrations and fish was a common food. Today is definitely not a day for celebration. Today, sons of men nailed the Son of God to an instrument of torture that was so painful it gave birth to the word excruciating. All through the Scriptures we see fatted calfs and lambs being slaughtered and consumed as a celebratory act. This one of the reasons that the Church fathers thought eating meat on this day would be highly inappropriate. We remember the death that Christ died, in all it’s graphic details, but we celebrate His resurrection in just a few days. It’s somewhat ironic that eating fish instead of meat was partly inspired by solidarity with the poor. In most western countries a piece of fish can be more expensive than a piece of meat. But this calculation doesn’t hold true for parts of the developing world. In lots of places meat is still a luxury, only to be consumed at very special occasions. It’s with this in mind that we have to remember that by eating lobster on Good Friday, we may be observing the letter of the law, but violating it in spirit. By denying ourselves something so common in our society as meat is, we should remind ourselves of those who can’t afford even the least expensive cuts of meat. This is just four short reasons for Good Friday abstinence, if you can think of any others please share them in the comments. God bless you and may you have a blessed and spiritually fruitful Easter season. This entry was posted in All Posts/Archive, Apologetics, Q & A. Tagged catholic, Catholicism, Christ, Easter, God, goodfriday, goodfridaynomeat, Jesus, meat.